This week has seen some of the worst weather conditions of the season with strong to gale force winds keeping the boats in for most of the week. With so much rain the level of the lake is now on the way back up 1m this week. The few boats that have ventured out have stayed in the shelter of the cages area and enjoyed good sport, Churchstoke angler Ken Llewellyn to a nice fish of 6lb 6oz last Sunday to follow up on his 8lb 8oz the week before,Ken was using an orange blob on a fast glass line. 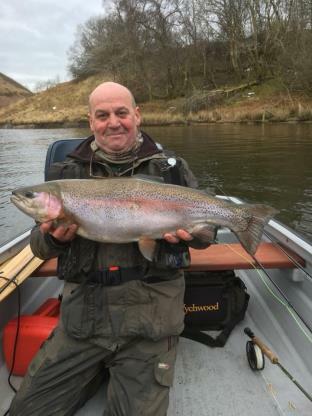 Another 6lb 8oz fish fell to Hugh Benyon of the Wye Knots team he took his fish on a black hopper close to dinas point. Very little to report off the banks this week as few have braved the awfull conditions fingers crossed things should settle down during the coming week ready for the Autumn buzzer hatch!